Would you join me in praying for Mcobi? He needs a friend. He's going to be 5 years old soon. He's a happy little guy that is surviving better today than when this picture was taken. You see how his hair looks a bit orange? That's due to some malnutrition issues. I believe the term is kwashiorkor but I'm not a doctor, nor do I play one on television. 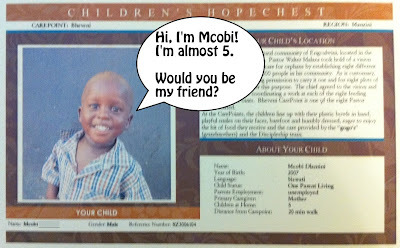 Mcobi, pronounced "em-koe-bee," is a young boy with a chance! He lives in a rural region near Manzini, Swaziland, Africa. And he's a real joy! Each day Mcobi walks about 20 minutes to the Bheveni Carepoint. There he is able to get two daily meals as well as play and learn with other children in the area. He's cared for by his mother as best she can. She's currently unemployed (along with about 80% of the Swaziland workforce) so getting by is not a simple matter. Mcobi has been a regular guest of Bheveni for some time now. I am looking for someone to come alongside him and mentor him. To send him letters of encouragement, to love on him from afar, and to lift him up in prayer each day. He needs someone to help financially support the efforts of the Carepoint too. This financial support helps the Bheveni Carepoint to always have enough food and assistance for Mcobi, and all of the children who visit each day. Right now there are around 150 children that visit, most of them regulars. 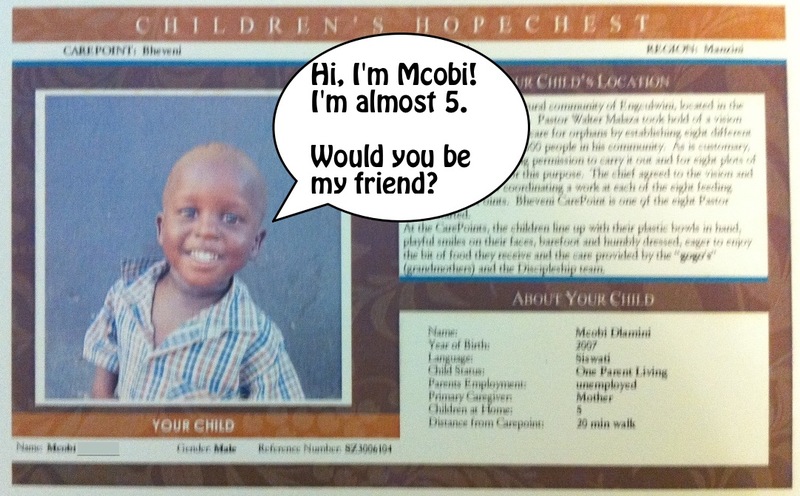 Would you join me in praying for a special friend for Mcobi? Someone to mentor him with monthly letters and financially support Bheveni with a candy bar each day? Yes...sort of. Monthly support is $34 each month, roughly $1.12 per day. For the price of a Snickers Almond (my personal favorite since the Mars bars were re-branded), Mcobi can be supported both physically, emotionally, and spiritually. Please join me in praying for him this week. Seriously, I'm only asking you to pray for him. Pray that God would direct the right person, family, youth group, or business to choose to connect with Mcobi. I'm not asking you to be that person. Really, I'm not. I don't want to put that kind of pressure on you. I'm believing that Mcobi will be sponsored soon though. I'm believing that as we join together in prayer for him, hearts will be moved and someone will want to be a special friend to Mcobi. If you happen to be that person, awesome! But if you're not, would you please pray for the one who is to step up and take action? By the way, Mcobi is getting healthier! He's been growing up well, and really a great example of the success of Bheveni Carepoint, the leadership there, and the effectiveness of sponsorship ("special friends" as we like to call them). Here is a photo from our visit in September 2011. Notice that his normal hair color has returned. He's a little star-struck by the camera though! If you would agree to pray with me this week, would you mind to leave a note in the comments below? If you are the one who believes you are Mcobi's special friend, who wants to send him a monthly letter or email, and provide $34 each month to help support him through Bheveni Carepoint, please contact me right now. Please don't put it off. If you know it's you, you'll be ecstatic when you just do it! CLICK HERE to email me and let me know. Please put "Mcobi Special Friend" in the subject of your email. I'll get back to you right away with the specifics! Thank you for praying for Mcobi and the children of Bheveni. Your support is truly wonderful!